By admin on October 7, 2016 in News, Want To Help? 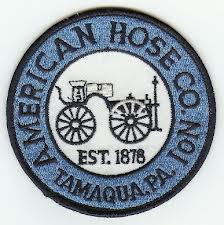 The American Hose Company will be having a pizza sale on November 12th. These will be 11 X 17 unbaked pies for pickup, 11Am till sell out. Cost is $8 per pie. Please see any member for tickets or you can email us at info@ahco1tamaqua.org. Pre sale preferred, but we will have a few extra that day for sale.